With 42% of marketers planning to increase their use of Instagram this year, visual content is more important than ever to a brand’s marketing strategy. But for many brands, creating a captivating Instagram profile and generating high quality visual content can be challenging. To help marketers get the most impact out of their Instagram profiles, here are the top three marketing trends that any business can learn from, whether you have 300,000 followers or 300. Many brands are leveraging branded hashtags to engage their community on social media, but these aren’t your standard #CompanyName hashtags. 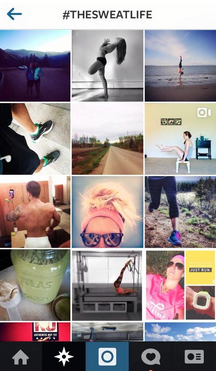 The hashtags are aligned with the overall brand instead of the product, and Instagrammers are encouraged to tag their photos whether the product is featured or not — for example, lululemon athletica suggested that users tag their workout photos with #thesweatlife, which has generated over 68,000 posts from their community. By creating a branded hashtag, marketers create a win-win situation for both themselves and their community. Brands receive the benefit of increased exposure to new potential customers through an Instagrammers photo, and Instagrammers love to be featured on a brand’s profile for both the prestige and the increase in followers. When one of my Instagram photos got “regrammed” by Stumptown Coffee, we gained nearly 500 followers in one day! That’s a lot of motivation for the Instagram community to actively share your brand. Herschel Supply Co has over 300,000 followers on Instagram and tags their product posts with #HerschelSupply, but they have generated more posts with their #WellTravelled campaign, which encourages their followers to share photos of their journeys using the hashtag. Poler Stuff has not one, but three branded hashtags (#campvibes, #adventuremobile, and #beneaththebrim) that they place in their Instagram bio. #Adventuremobile isn’t directly related to any of Poler’s products, but it does speak to their brand persona of active, outdoor living, with over 40,000 posts shared by Instagrammers of their car in the wild. You don’t have to be a large brand in order to have success with your own hashtag: 33 Acres Brewing Co, a small craft brewery, has about 4,000 followers and recently started their own tag #b33r and encourages in-store customers to tag photos with this hashtag over other ones. Without an “official” hashtag, it becomes difficult to monitor your brand mentions – for example, customers could be tagging #33acres, #33, #33acresbrewing, or #33acresbeer. But by creating and promoting their own distinctive branded hashtag, marketers can easily increase their exposure across Instagram while providing their brand with user-generated content for their Instagram profile. Another way to market your brand on Instagram without posting product shots is to share lifestyle content that represents your brand’s persona. Marketers should monitor their followers to see what kind of content they are sharing, and then replicate that on their own feeds. Intersperse photos of your product with lifestyle photos that your followers can relate to, whether it’s oceans and palm trees or mountains and landscapes. The Native Shoes brand likes to #keepitlite, so their feed features a ton of bright colours and different art that would be interesting to their community. With so many Instagrammers looking to increase their following, it’s easy for even small businesses to gain exposure to a wide audience by building relationships with influencers in their community. While many large brands are paying big bucks to partner with users that have thousands of followers, both small and medium businesses are still able to increase exposure by exchanging product for a giveaway, a promotion, or a small fee. But be warned: simply sending free product doesn’t mean the Instagrammer will love it, and just because a user has a lot of followers doesn’t mean they’ll create captivating content for you. Take the time to ensure influencers are the right fit for your brand and that they’re excited to partner with you! Get your business on Instagram today! Taylor is a creative strategist and co-founder of Local Wanderer, a travel brand. A previous HootSuite employee, she now contributes to the blog by exploring emerging trends and patterns in social media.